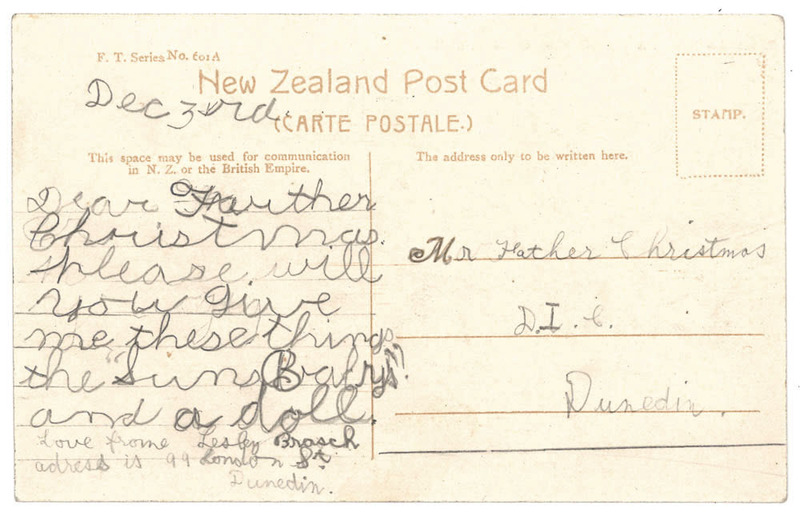 One of the cutest Christmas messages in the Hocken Collections is found on a postcard in the papers of Dunedin poet and editor Charles Brasch. the “Suns Babys” and a doll. adress is 99 London St.
Lesley Brasch, known in her family as ‘Lel’, was Charles’s younger sister. Their father was the lawyer Hyam Brasch, and their mother Helene (née Fels) was related to the Hallensteins, a prominent Jewish family associated with the New Zealand Clothing Company and other businesses. Born in 1911, Lel lived with her parents and brother at ‘Bankton’. Originally the home of Rev. Thomas Burns, and later of Sir Robert Stout, its address was 99 London Street when the postcard was used. The property was later subdivided and other houses have since been built in front of it. Its address is now 4 Stoutgate. 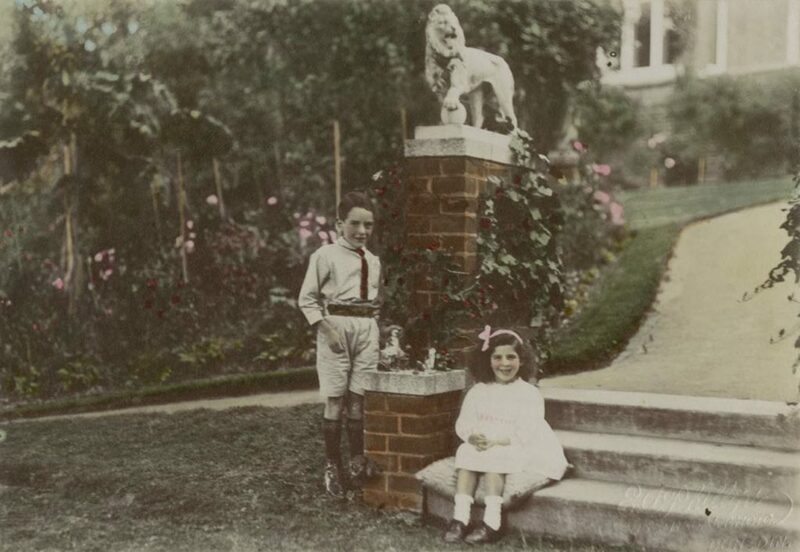 Lesley with her brother Charles at ‘Manono’, London Street, the property of their grandparents, Willi and Sara Fels. Bankton was a little further up the street, on the opposite side. E.A. Phillips photographer. Ref: Hocken Collections MS-0996-012/100. We don’t know what year Lel wrote her request, but it was when she was a little girl in the 1910s. She addressed it to Father Christmas at the D.I.C., or to give it its complete mouthful of a name, the Drapery and General Importing Company of New Zealand Limited. Her own great-grandfather, Bendix Hallenstein, established the business some thirty years or so before. The Dunedin department store was a logical place to send a message to the jolly red-suited man. 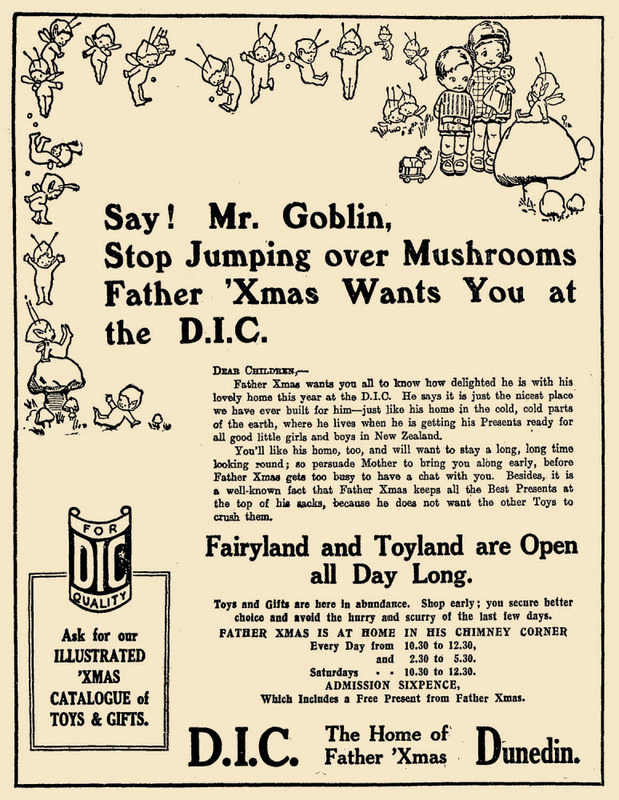 From 1902 children could visit him every afternoon before Christmas, and in the 1910s the company advertised: ‘Father Christmas is at Home at the D.I.C.’. In 1917, the store advertised ’20 big busy departments full of Xmas gifts’, and a Toyland for Children. It invited parents to bring their children to see Father Christmas in his quaint old chimney corner. Admission was sixpence and children were given a present. Seventy years later children still visited the D.I.C. to see Santa. Its later attractions included Pixie Town, now on display at Toitū Otago Settlers Museum. The D.I.C.’s Dunedin store closed in 1991, after the company was taken over by Arthur Barnett. Advertisement from the Otago Daily Times, 15 December 1917 p.2. 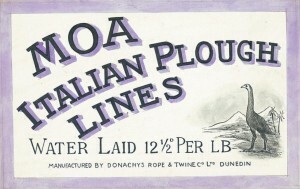 Papers Past, National Library of New Zealand: https://goo.gl/nCBBvo. Lel asked Father Christmas for a popular and particularly beautiful children’s book, The Sun’s Babies by Edith Howes. Even at a young age the Braschs were supporting New Zealand writers! Born in London in 1872, Howes came to New Zealand with her family when still an infant, and became known as a teacher, writer, and educationalist. 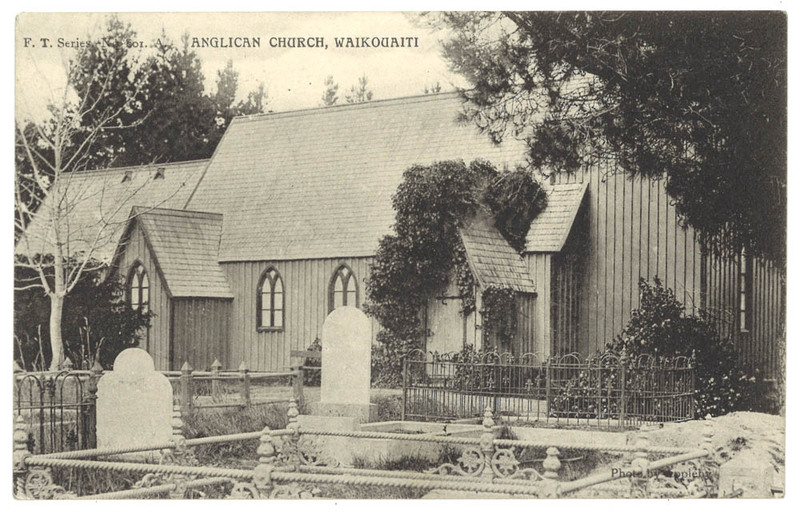 She lived in a variety of places around the country, including Ashburton, Wanganui, Makarewa, Gore, Wellington, and Christchurch. In later life she lived in Dunedin, where she died in 1954. 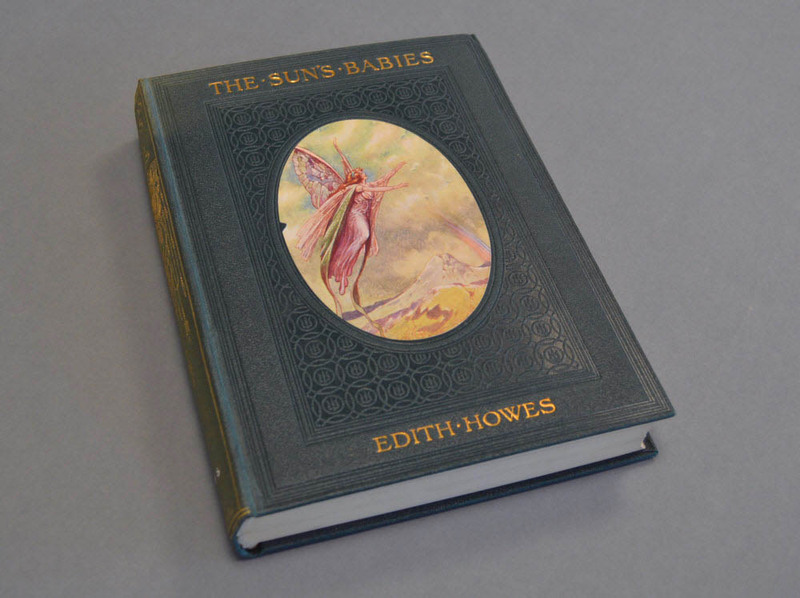 The Sun’s Babies, published in 1910, is set in a mythical fairy world. It includes stories and poems about plants, animals and fairies in the different seasons of the year, incorporating life lessons. The first of Howes’s children’s books, it met with both critical acclaim and popular success. Hocken holds three editions of the book, including Cassell & Co’s original 1910 edition and the 1913 edition shown here. The illustrations are by the English artist Frank Watkins (1863-1929). Howes, Edith. The Sun’s Babies. London: Cassell and Company, 1913. Hocken Publications, Bliss YO How.s. 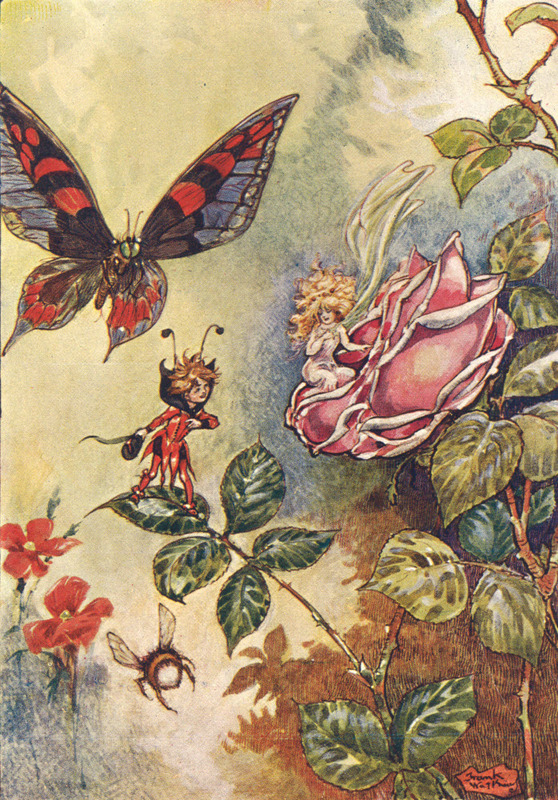 Illustration by Frank Watkins from The Sun’s Babies. The caption reads: ‘When she saw Tinyboy she hid her face shyly in her curls’. There are thousands of postcards in the papers and they are less studied than many other parts of the collection. This particular card can be found in the item: ‘Envelope labelled “Loose postcards” including postcards from family and de Beer, Fels, Hallenstein and Brasch families’ (Charles Brasch papers, Hocken Archives, Uare Taoka o Hākena, MS-0996-012/521). Merry Christmas from the Hocken Collections. Today (9 June) is International Archives Day. Created in 2008 to raise awareness of the importance of archives, and of what archivists do, the date was chosen to commemorate the establishment of the International Council of Archives (ICA) on 9 June 1948. Archives and archivists across the world use the day as an opportunity to promote what they do, and to promote the use of archives. I thought I would take the opportunity to write about an interesting archival volume I looked at recently. This volume encapsulates for me what is so interesting about working with archives and how researching the stories documented in archival items can lead us down many different narrative pathways. The volume originally caught my attention on the Hākena catalogue because the name in the title was clearly unusual and to my eye looked just wrong! A spelling mistake maybe? Making sure the description of archives is correct or as correct as it can be is one of my responsibilities here so I decided to have a look at it. 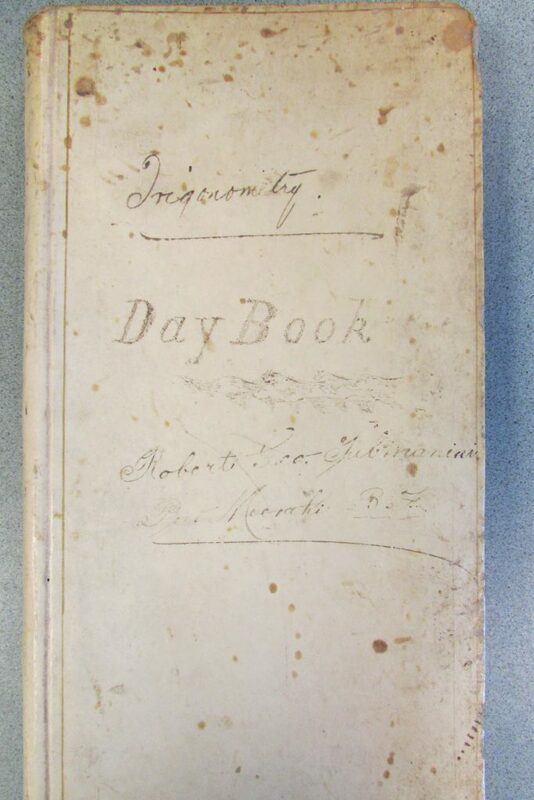 The title was “[Tubinanini], Robert George : Port Moeraki Day Book (1858 – 1873)”. The titles of archival collections are constructed with the name of the creator of the collection first, and then a brief descriptive title. This is in accordance with the standards set by the ICA. So in this case the archivist had (not unreasonably) taken the most obvious name that they could find on the volume, and decided to use that as the creator portion of the title. They had enclosed this portion in square brackets to show that they were unsure of the correct spelling and that this was their interpretation of the hand writing. It is a tall 19th century volume bound in white velum, looking a bit like Harry Potter might have doodled in it with some odd notes and diagrams in one section. Some pages have been cut out towards the end of the volume. 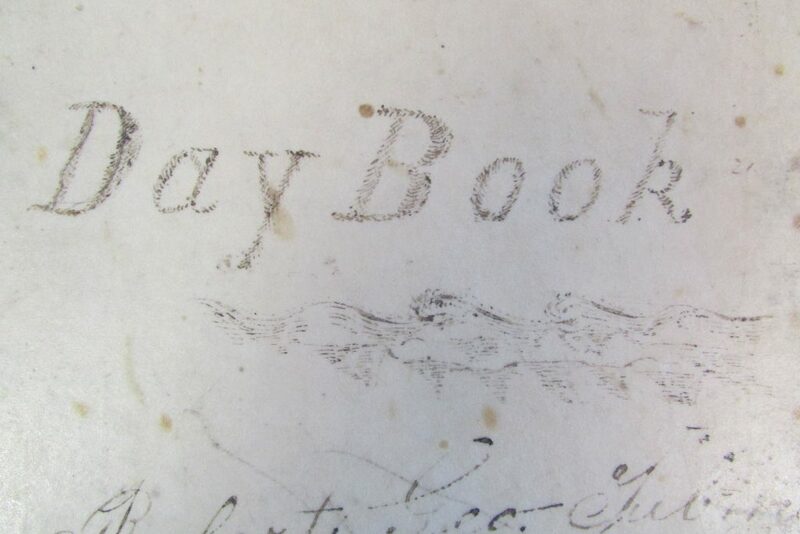 The front of the volume, note how carefully the words Day Book have been drawn, along with the image of waves at sea. It clearly started life in October 1858 as a day book (sometimes called a cashbook) – a book that records financial transactions in date order. The front of the volume seemed to have been labelled in a couple of different hands and at different times. The words included “Trigonometry”, “Day Book”, “Robert Geo. 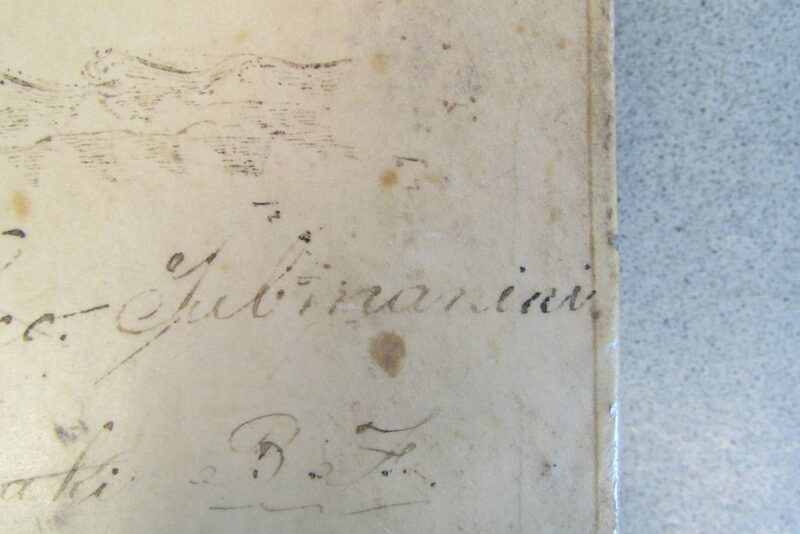 Tubmanini” (my reading of the problem name), “Port Moeraki”, what looks like the initials “B. F.” and a doodle of waves. Perhaps the doodler spent a lot of time at sea? “Tubman” with the letters “ini” seemingly added later in darker ink. Despite being acquired in 1974 the volume was not catalogued until 1998 when it was added to the online catalogue Hakena, things have changed since then and it is a lot easier to quickly research names and places by a quick “googling”. I started with the name Robert George Tubinanini – the reason I have noticed the record on Hākena in the first place. It seems likely that he is the Robert Geo. Tubmanini named on the cover of the volume and that the Harry Potter doodles are his trigonometry notes. What is not clear is why his name has the extra “ini” on the end (another idle doodle perhaps?) and why he had the day book and used it as a notebook. Back to the daybook portion of the volume. 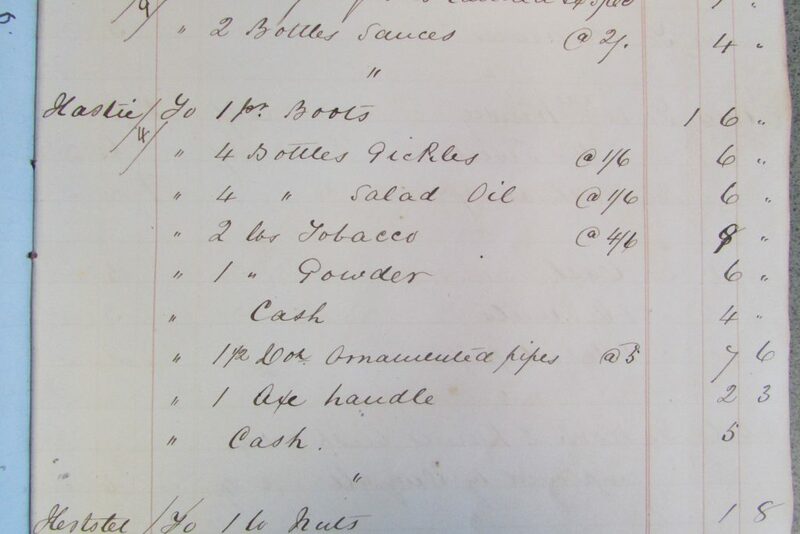 This is a particularly detailed example of a day book, and list transactions in date order, with the person’s surname, the goods purchased, shipped or received and the cost. I noticed that there were regular entries under particular names, clearly the store was a key institution in this community. Some names were European but there many Maori names as well. A keen researcher of Moeraki history is sure to find much of interest. The names Wi Te Pa, Pokuku, Riruha, Pita, Hokopa, Rawiri, Ohua, Karauria all appear regularly but there are many others. European names include McGlashan, Haberfield, Hastie, Hopkinson, Adam, Thomas, Mason, Tom and more. One name that stood out was Hertslet, it is unusual and cropped up almost daily. This time I headed straight to Papers Past, the National Library website which has revolutionised access to the myriad information contained in early NZ newspapers. I found that Henry Charles Hertslet regularly advertised the services of his store at Moeraki as well as other business ventures. He was also a Justice of the Peace for a time. An entry in the Otago and Southland volume of the 1904 Cyclopedia of NZ which revealed that Hertslet had a background in the “Public Records Department London” in the early 19th century before migrating to NZ. This was a nice serendipity as the Public Records Department is now known as the Public Records Office, and is the national archives of the UK. I guess you could say he had worked as an archivist, like me! From what I found online, Mr Hertslet clearly had a long and varied career as an early settler in several parts of NZ but is mainly associated with Oamaru, Moeraki and Naseby. According to C.W.S. Moore’s book, Northern Approaches, and Gavin McLean’s Moeraki 150 years of Net and Plough Share H.C. Hertslet was landing agent for Moeraki from 1851, and later purchased a schooner, Queen, to run a service between Moeraki and Oamaru employing Maori from Moeraki to man the boats. 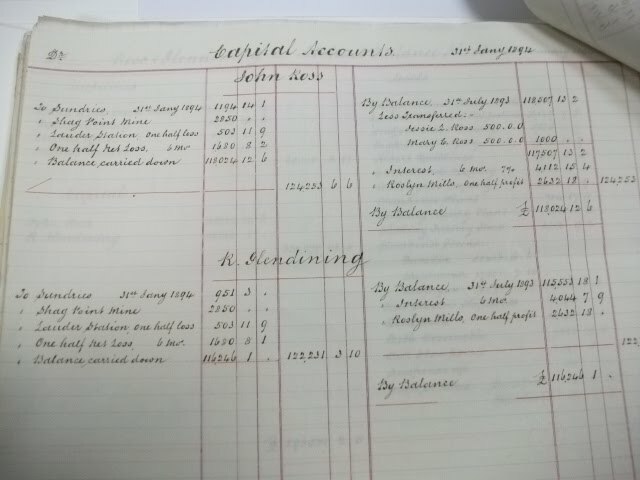 At the back of the book are further dated lists of payments but these appears to be wages paid to a number of workers including Fitzgerald, Frederick Cockerill and Joe. Thompson. The work done was activities like delivering firewood, ploughing, harrowing and draying. 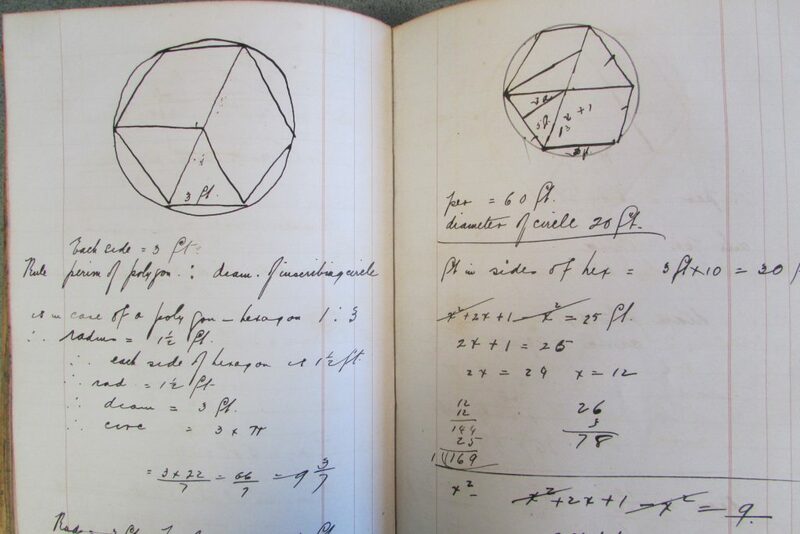 To sum up, this volume is a record of the transactions of the Moeraki store kept by either Mr Hertslet himself or one of his employees, sometime later it came into the hands of Robert Tubman, who seems to have taken advantage of some blank pages to write up his trigonometry notes. Later again it was acquired by the Hampden Historical Society which donated this volume to the Hocken along with around 40 others when the Society was wound up in 1974. In archivists jargon it has multiple provenance, it was created and used by more than one creator but is all the richer a source of history for that. It leads us to several narratives – the lives of Henry Charles Hertslet, and Robert Tubman, and to the broader social and economic history of Moeraki in the mid 19th century. Family historians may be interested to find references to the day to day dealings of their ancestors. 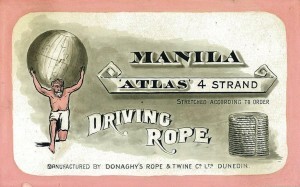 Among our largest collections of business archives are the records of rope makers Donaghys Industries, who began operations in Dunedin way back in 1876. They are still in this trade 136 years later, but have also widely diversified into the rural, industrial, marine and aquaculture markets. In the 1990s the company moved its head office to Christchurch but it maintains offices in Dunedin and Melbourne. Hocken’s relationship with Donaghys goes back to the 1980s when we received most of the current collection. In 2010 staff were invited to the company’s Bradshaw Street premises where we collected further financial records, photographs, administrative files, photographs, ephemera, and other records, some dating back over a century. Arrangement and description work was completed in 2011, increasing the size of the collection by over 50 percent to 45 shelf metres (that’s 2,500 individual items). More recently, the entire collection was entered onto our Hakena archives and manuscripts catalogue which has made the collection much easier to search and access. 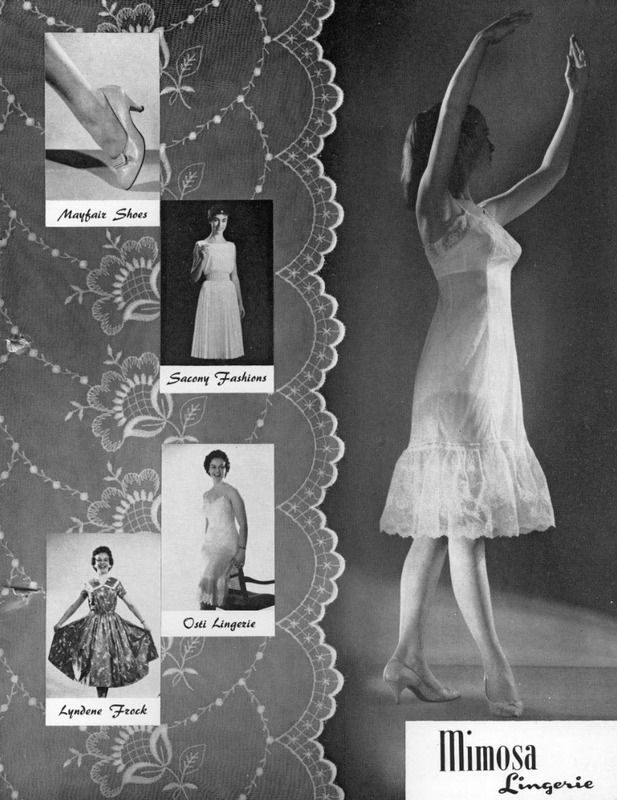 Shown here are some label illustrations (MS-3560/0560) and 1960s photographs taken by Campbell Studios in Dunedin (MS-3560/0633). 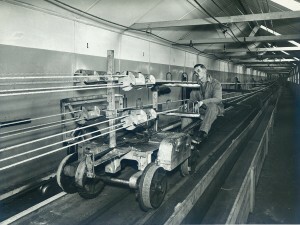 Two show rope manufacture processes, an in one a worker can be seen in the famous 380-metre ‘rope walk’. 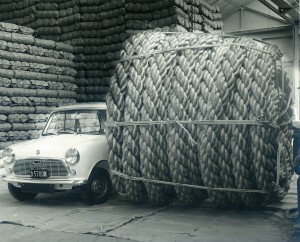 Another shows a bale of rope bigger than a Mini. 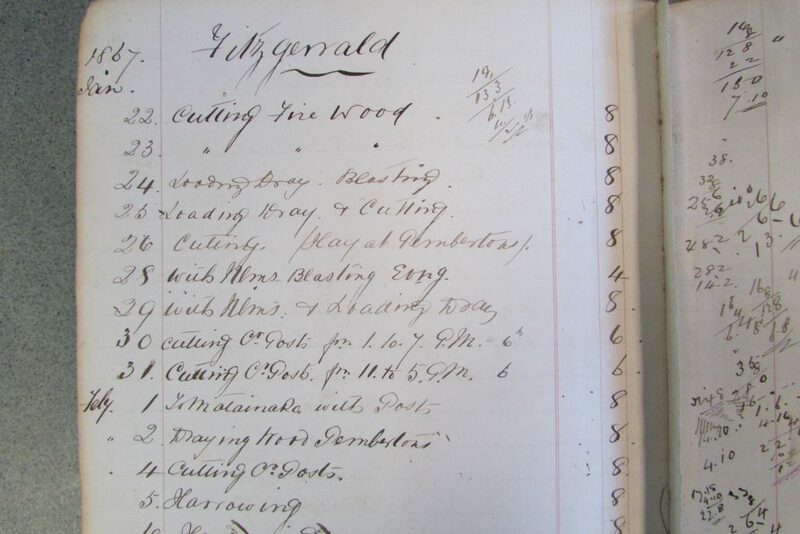 We are delighted that Donaghys Industries have ensured the preservation of their historic records, and are always interested in hearing from other local businesses. Watching TV’s ‘Briscoes Lady’ promoting another birthday sale, few would be aware that the birth of the Briscoes company dates to the eighteenth century. It was probably William Briscoe who established the firm in Wolverhampton, Staffordshire, sometime around 1750. One reference mentions a balance sheet dating from 1756 and another gives the establishment date as about 1768. In 1781 members of the Briscoe family signed a partnership agreement. 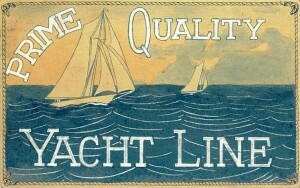 Headquarters eventually moved to London, with branches established in the West Indies and South America. A Melbourne offshoot was established in about 1854, and New Zealand operations opened in Dunedin as Arthur Briscoe & Co. in 1863. In New Zealand the company operated primarily as wholesale ironmongers and hardware merchants, but with some retail trade. 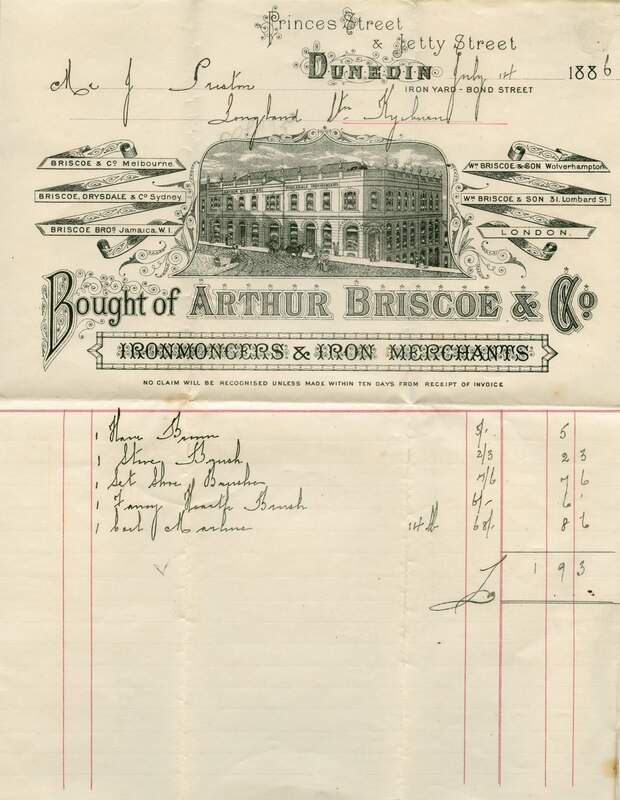 Arthur Briscoe, one of the company partners in England, probably never visited New Zealand. The founding manager in Dunedin was Hugh MacNeil, who had begun his working life as an ironmonger in Glasgow before managing Briscoes in Melbourne. He became a partner in the firm in 1880 and gained managerial control of both the New Zealand and Australian operations. 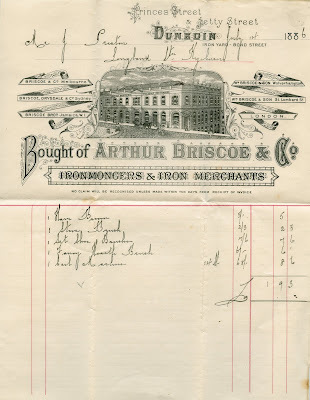 The lithographed billhead here, dated 14 July 1886, shows that different parts of the organisation were styled in different ways: Wm Briscoe & Son (Wolverhampton and London), Briscoe & Co. (Melbourne), Briscoe, Drysdale & Co. (Sydney), Briscoe Bros (Jamaica), and Arthur Briscoe & Co. (Dunedin). 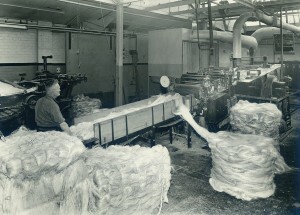 In the 1890s branches were established in Wellington and Auckland as Briscoe, MacNeil & Co. The billhead features the company’s buildings on the corner of Princes and Jetty streets, which were designed by R.A. Lawson and opened in 1872. An Otago Daily Times report from that year describes a company importing directly from Europe and America, with an average of 100 tonnes of goods unloaded at Port Chalmers every week. Stock included such diverse items as kitchen stoves, umbrella stands, lamps, and lawn mowers (‘a wonderful little machine of recent invention’). Some goods, such as enamel kitchenware and cooking utensils, were similar to items sold in Briscoes stores today, but linen and soft furnishings have only become staples in recent decades. Much business was directed towards the building trade, and at a separate iron yard in Bond Street there was much in the way of iron bars, piping, and sheet iron, with a supply of up to 150 tonnes of nails in stock at any one time. 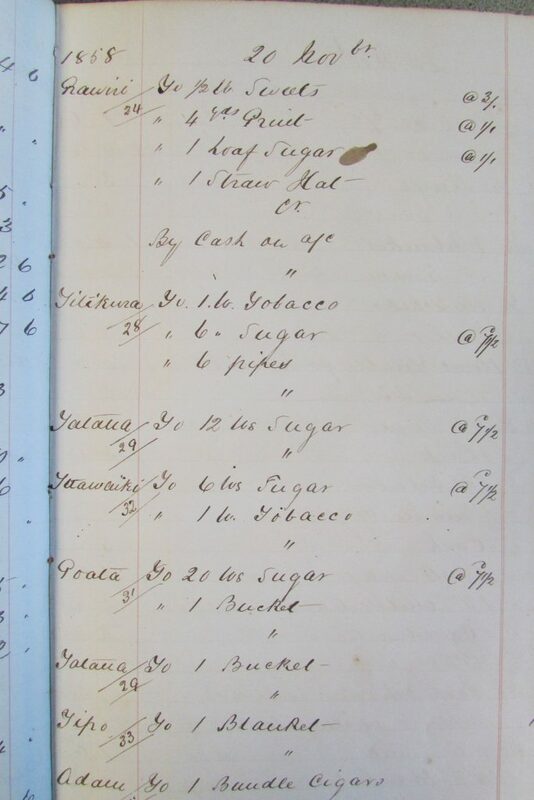 The company also imported tea for many years. Briscoes moved to new premises in Crawford Street in the 1900s and the old building was later occupied by T. & G. Life. They demolished it in the 1950s to put up the building now known as Upstart House. Briscoes’ head office moved from London to Melbourne in 1958, and then to New Zealand in 1970. The parent company was purchased by Merbank Corporation of Australia in 1973 and transformed from a wholesaler of imported goods to a general merchandise retailer. Briscoes Group Ltd was purchased by the R.A. Duke Trust (of New Zealand) in 1990 and became a public company in 2001. As of 2011 it has 54 Homeware stores and 32 Rebel Sport sporting goods stores throughout New Zealand. 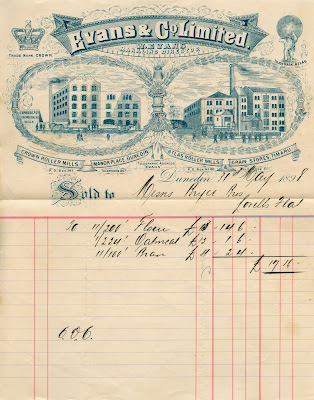 Hocken holds some financial and other records of Briscoe & Co., 1865-1970, under the reference number MS-3300. The billhead is from the Preston family papers (MS-0989/058). Every now and then, often in an obscure part of the archives collections, I come across one of those ornate old letterheads or billheads so many businesses used to have. These often show the printers’ great artistry and skill, and intriguingly encapsulate the identities of businesses in a way that might now be considered to be branding. Here’s one of my favourites. 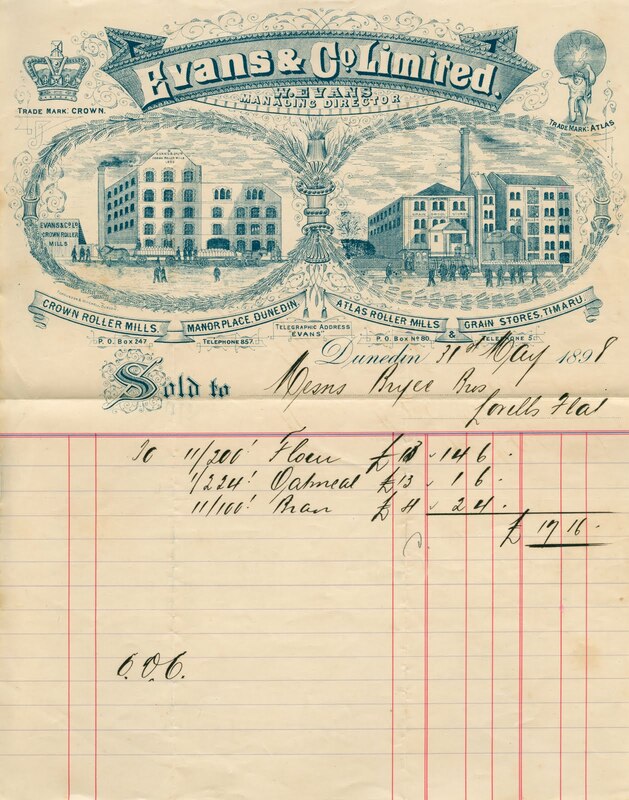 Dated 31 May 1898, it’s for W. Evans & Co. and depicts the mills which produced ‘Crown’ brand flour in Dunedin and ‘Atlas’ brand flour in Timaru. The design and engraving work by Dunedin firm Fergusson & Mitchell is elaborate. Sheaves of wheat curl around to form an imaginative border, and the perspectives of the buildings have a wonderful naivety to them. The address for telegrams is given (‘Evans’) and the Timaru mill has the easy-to-remember telephone number ‘5’. 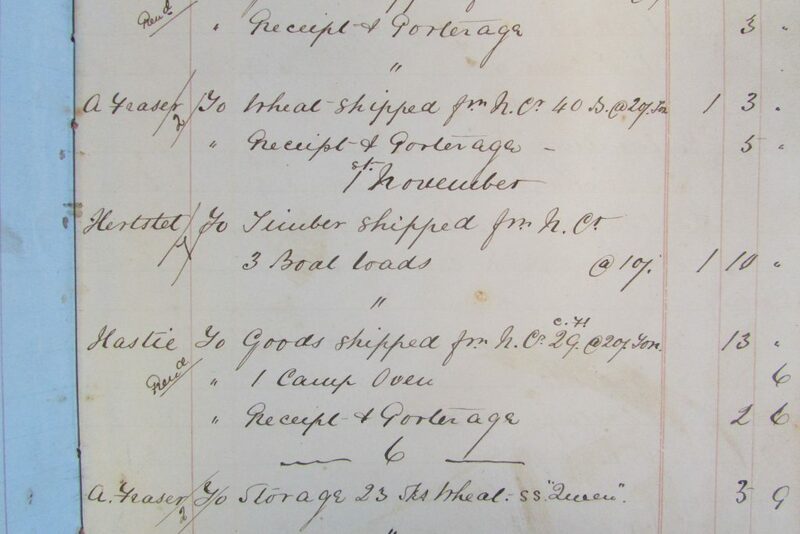 In front of the Dunedin building are horses and carts loaded with bags of flour. The Timaru mill was next to the railway line, so an engine and wagons can be seen. These were roller mills, then a recent development in New Zealand, which used cylindrical rollers for grinding rather than traditional grindstones. Timaru’s Atlas mill, designed for Evans & Co. by Dunedin architect James Hislop, opened with this latest equipment in 1888. Dunedin’s Crown mill had been built for Anderson & Mowat in 1867 and converted to a roller mill for R. Anderson & Co. in 1891. Additions to the buildings at this time were also designed by Hislop. This mill was taken over by Evans & Co. in 1896. The managing director, William Evans, had begun his career in New Zealand as a storekeeper on the goldfields, having arrived from Victoria with the rush to Gabriel’s Gully in 1861. Both mill buildings, although they no longer produce flour, remain prominent landmarks in Timaru and Dunedin. Blog post prepared by David Murray, Assistant Archivist. Billhead found in Preston family papers (MS-0615/004). 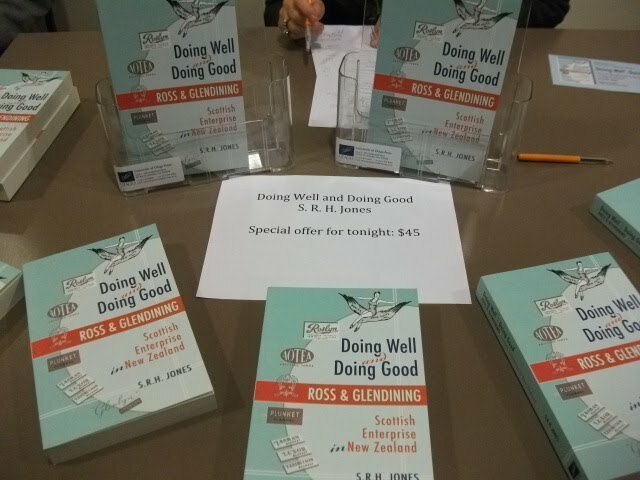 The Hocken Collections recently hosted a book launch for the long awaited (by Hocken staff anyway) book by Stephen Jones, Doing Well and Doing Good : Ross and Glendining: Scottish Enterprise in New Zealand, published by OU Press. Steve has been a regular visitor to the Hocken through several “generations” of archivists and reference desk staff. For many years he made an annual pilgrimage to Dunedin from his Scottish home in Dundee to complete the next phase of research on the records of Ross and Glendining held in the Hocken Collections. Tips on finding material in the collection and Steve’s interests in Ross and Glendining were passed on from archivist to archivist as it became known that exemplary service could result in a free lunch! Reams of photocopied pages were dispatched to Dundee, but they only seemed to encourage him to travel back to NZ with further questions to be answered by interrogation of the original records! 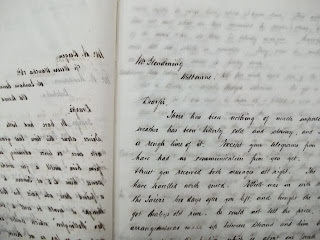 Business communications from an 1877 Ross and Glendining letterbook, the paper is translucent and thin as tissue and difficult to photocopy from. We admired his passion for lists of obscurely written financial reports and the analysis of the business data he copied from the records and wondered what the result would be. My own interest in the progress of the project was further stimulated by attending an excellent presentation in the School of Business by Steve on his research findings. 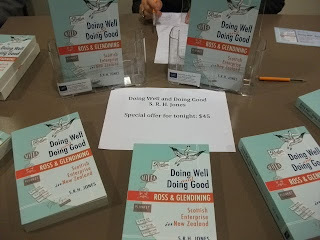 The quarterly financial reports had been analysed, the columns of handwritten numbers in pounds shilllings and pence totted up and made meaningful and Steve described the role of Ross and Glendining in the fabric of NZ life. I’m looking forward to reading the book and reviews are very positive. The Hocken staff are really pleased to see the work finished and published but we will miss Steve and his visits. A handwritten financial activity report for the six months prior to January 1894 from the Ross and Glendining archives. 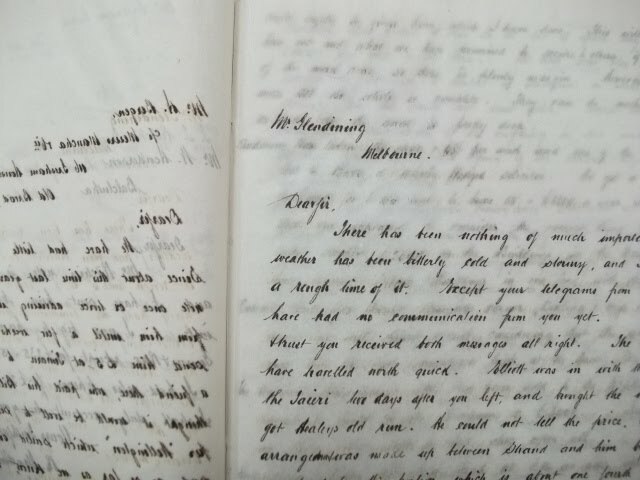 Stephen read hundreds of pages such as this during his research.